Recently, the world of television has gotten a whole lot better, and also a whole lot more confusing. While the choice used to be simply a question of which mediocre-quality CRT television you would purchase – you remember, don’t you, those ugly square boxes that used to sit in every living in America, and now sit comfortably at the dump? With the introduction of HD television, video games, and BluRay DVDs, TV technology has met the challenge, with sleek, thin new models that look attractive and provide an incredibly high resolution of image. But they also make the world more complicated, with three distinct TV types to choose from: LCD, LED, and Plasma and you’re often ask yourself which one is the best tv. Working with a limited budget but wanting to get the best possible image, it can be difficult to know which model represents the best TV for the money. We will go over the features of each to help you answer this. If budget is your only concern, then LCD televisions certainly represent the best TV for the money. They are the least expensive of the three. However, they do provide the lowest image quality of the three. They have the lowest ‘refresh rates’ (the speed at which the television is able to change its image as the image changes), which means you may begin to see motion blurring and image doubling. They also have lower contrast ratios, which is the difference between the whitest white it can display and the blackest black. This means less vibrant colors, but it does have a positive side effect: if the television is placed in a room with lot of ambient light or even direct sunlight, LCD televisions won’t have as much glare or washed-out color as the other two. The next step up is the LED television. 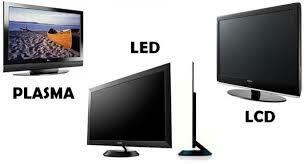 LED televisions are actually LCD televisions, just with a better light source. Instead of their backlight being provided by a fluorescent bulb, it’s provided by a series of LEDs. This means a brighter, crisper image with a higher contrast ratio more vibrant colors. LEDs actually use less power than fluorescents, which means you’ll save money down the line, as these televisions are the most energy efficient of the bunch. However, LEDs still have the same refresh rate issues as LCDs. Certain LED (and LCD) televisions compensate for this with models that have higher refresh rates, but these do cost more money. Over all, for the balance of image quality and price, LED television may represent the best TV for the money. If you’re really concerned about getting the highest quality image, especially if you’re watching a lot of quick action, such as sporting events or modern video games, plasma is certainly the way to go. Plasma televisions offer the smoothest motion out of any television, and the highest contrast ratio and color reproduction. However, they the most energy of the three, they experience bad glare from outside light sources, and they’re the most expensive. Ultimately the best TV for the money is the TV that works at your budget level and for what you want to watch. We recommend Samsung UN40EH5300 40-Inch 1080p 60Hz LED HDTV as best TV for the money.